European officials have lashed out at Kiev after Ukraine’s former prime minister, Yulia Tymoshenko, was jailed for seven years for abuse of power. Brussels says the trial was biased and warns the verdict will have serious repercussions. President of the European Parliament Jerzy Buzek said he regretted Tuesday’s sentence and wished it to be reconsidered in an appeal. The sentence “causes concern over its politically-motivated nature and the discriminatory use of law in Ukraine,” he said. The European Commission’s Foreign Policy Chief Catherine Ashton said in a statement that the EU will review its policy towards Ukraine. Kiev’s approach to the trial poses a risk “of serious repercussions to bilateral relations between the European Union and Ukraine,” and will have an impact on “the Association Agreement, our political dialogue and our co-operation in a broader sense,” the statement said. The trial by a Kiev court “did not meet the international standards for a just, transparent and independent judicial procedure,” said Maja Kocijancic, Ashton’s spokesperson. Earlier, Brussels warned it would deny Kiev the EU Association Agreement it covets, should Tymoshenko be jailed. The threats to freeze talks on integration are somewhat detached from reality, believes John Laughland of the Paris-based Institute for Democracy and Co-operation. “I think the European Union will react badly. On the other hand, frankly, there is no chance at all of Ukraine joining the EU at least in the next 10 or 15 years. So these negotiations are really just for form’s sake. They don’t have any bearing on reality,” he told RT. ­The imminent setback in talks is regrettable regardless of the unlikelihood of Ukraine joining the EU anytime soon, argues British MEP and member of the European Parliament's Foreign Affairs Committee Richard Howitt. “Ukraine’s potential EU membership is some years away and we shouldn’t pretend otherwise. But we do want the counties in Europe’s eastern neighborhood to get closer to Europe in terms of European values like the rule of justice. And this is clearly an extraordinary setback,” he told RT. 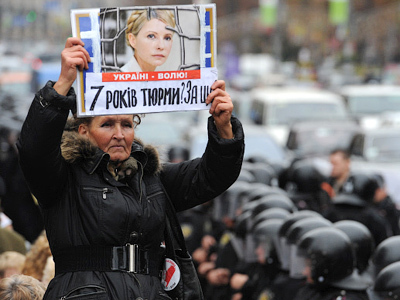 Ben Aris, Editor-in-Chief of Business News Europe, says the jailing may actually benefit Tymoshenko’s political career in the long run. ­Tor Bukkvoll from the Norwegian Defence Research Establishment says that, despite hoping for closer ties with the EU, the Yanukovich administration still wants to do things at home in their own sweet way. Bukkvoll added, however, that in his opinion, Kiev still wants to pursue the Free Trade Agreement and the Association Agreement with the European Union.